The best fighter to ever come from Argentina put on a show for the fans in his home country over the weekend as Santiago Ponzinibbio brutally knocked out Neil Magny in the fourth round of their main event at UFC Fight Night 140. 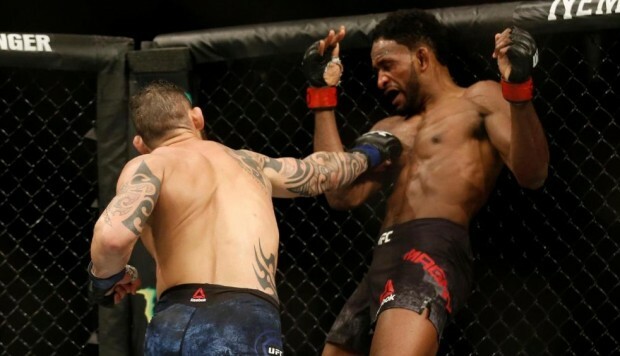 Ponzinibbio pressured Magny the entire fight and threw caution to the wind the entire time as he battered his opponent with low kicks and punches that should have triggered Magny's corner to throw the towel in. Instead, Magny was too tough for his own good, as the fight went into the fourth round, when he suffered a faceplant KO loss. 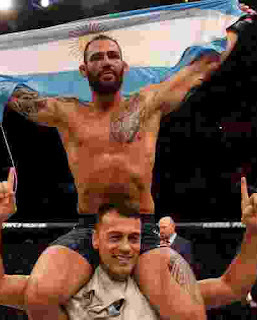 The win for Ponzinibbio sent the Argentine crowd home happy, and announced the native of La Plata as a top-10 welterweight in the UFC, as he's now on a seven-fight win streak and 9-2 overall in the Octagon. That's good stuff. In his post-fight interview, UFC commentator Jimmy Smith asked Ponzinibbio who he wants next, and he called out UFC Welterweight Champion Tyron Woodley. It's good to hear a fighter call their shot, and Ponzinibbio figured he had nothing to lose by calling out the champion, but when you think about it, this isn't a reasonable callout. Even with the win over Magny pushing Ponzinibbio's stock to the highest it's ever been, he's still not even close to being a legitimate title contender in what is arguably the UFC's most top-heavy division at the moment. After dispatching Darren Till back at UFC 228 in September, Woodley is now expected to fight former UFC Interim Welterweight Champion Colby Covington in early 2019. 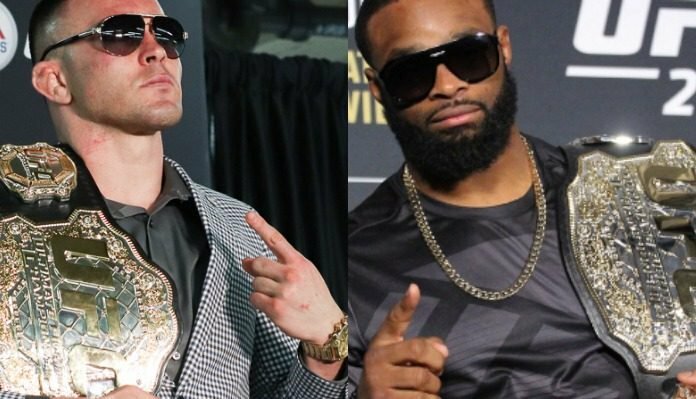 There's no date officially set for this bout yet, but rumors have it that the Woodley vs. Covington fight could happen as soon as UFC 233 in January in Anaheim or UFC 235 in March in Las Vegas. Ponzinibbio must be angling for the winner of that fight, and figured he might as well throw his name into the hat when Smith asked him who he wants to fight. But realistically, Ponzinibbio is still very far away from a title shot. As good as Ponzinibbio's seven-fight win streak is, there's a guy named Kamaru Usman who has an eight-fight win streak right now who is even higher ranked and more deserving of a title shot. Usman takes on former UFC Lightweight Champion Rafael dos Anjos at the TUF 28 Finale later this month, and if he wins that fight, the UFC is going to be hard pressed to deny the man a title shot after winning nine fights in a row. It's very rare that someone wins that many fights without getting a title shot, and Usman has been waiting for a crack at the belt for a while. Even if Pozninibbio is a more exciting fighter, Usman stylistically has a better chance to defeat either Woodley or Covington, and I believe the UFC will be looking to book him for the belt next should he beat RDA. Aside from Usman, there's also UFC newcomer Ben Askren to think about. Askren is 18-0 with 1 NC in his career, and the undefeated former Bellator MMA and ONE Championship welterweight champ takes on Robbie Lawler in his Octagon debut at UFC 233. Askren is a much better talker than Ponzinibbio, and he also stylistically matches up better against either Woodley or Covington. Even if Lawler is on the decline, he's still a top-five ranked title contender at 170 lbs. If Askren beats Lawler in his UFC debut, it would be hard to put Ponzinibbio above him in the title shot pecking order. If I'm Ponzinibbio's management, I don't think there's any reasonable way I can expect my guy to get a title shot, not with so many other contenders still waiting. Right now, Ponzinibbio is well behind Covington and Usman, and maybe Askren soon enough. If I'm Ponzinibbio's management, instead of telling my fighter to ask for an unrealistic title shot, I would be pushing for a bout with Till or Stephen "Wonderboy" Thompson, both of whom are ranked in the top five right now without fights booked. Both those guys are strikers, and Ponzinibbio matches up better with both of them. 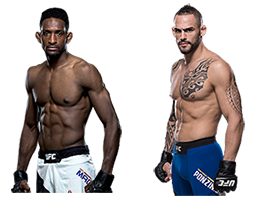 Ponzinibbio is clearly very good, but he's not a top guy right now and he hasn't beaten one yet. I don't blame Ponzinibbio for calling out Woodley, but it's not a realistic fight at the moment. Maybe a year from now, but not now. For now, he should focus on beating a top-five guy and then go from there. While some may be calling for him to get a title shot today, two weeks from now the same people will be calling for Usman to get one. This sport moves fast, and unfortunately the timing isn't good for Ponzinibbio right now. All he can do in the meantime is keep fighting and keep winning, but even with a KO of the Year candidate against Magny, he's still nowhere close to fighting for the belt. UFC Fight Night 140: Magny vs. Ponzinibbio takes place November 17, 2018 at Estadio Luna Park in Buenos Aires, Argentina.